As you may have noticed this year, primarily… well only from this site, the newest trend going on is that orange sodas now represent the feeling of winter. Put it up there with crisp cool air, family, and ice skating. Today’s festivities allow us to open another bottle of Chubby, this one with the interestingly named flavor of Orango Tango. Today the mascot on the label, who I assume is named Chubby, just seems to be standing there smiling at me. He’s a rather friendly looking fellow. If you don’t feel like reading previous Chubby reviews I’ll give you a quick rundown. 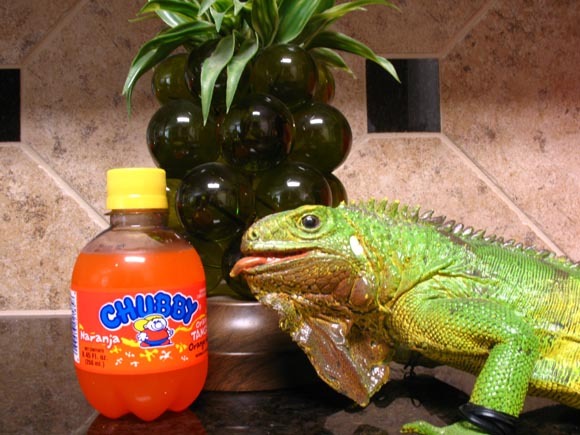 Chubby is a drink from Mexico sweetened with sugar and tends to be very average in taste while being overly sweet. Let’s find out if Orango Tango walks along this same path. Chubby Orango Tango smells like a fun fizzy orange as the bubbles jump up to grab my nose. Hopefully they’re welcoming me to the drinking experience and not trying to warn me of my impending doom. That might be a Twilight Zone episode, but I’m going to chalk it up as an original idea. Bleh. Chubby Orango Tango has very little carbonation so I’m now in fear of whatever was jumping up at my nose making me think it was fun bubbles, or fubbles. There is an orange taste thankfully, but it’s one masked in the shroud of cardboard as so many mediocre to bad orange sodas are. When I say something tastes like cardboard I’m not using that as a blanket statement that it tastes badly. This actually tastes of cardboard, like you licked a packing box of some sort. The only thing Chubby Orango Tango has going for it is that the aftertaste reminds me of generic orange candy that you might find in a Piñata. I can’t recommend this to anyone. You could go to the store and pick up a Sunkist, chemicals and all, and it would taste much better than Chubby Orango Tango. I’m going to throw an artistic fit now and claim that this soda has brought me such banal flavoring that I’m too distraught to continue this review. Twist is ashamed to be this close to mediocrity.